I'm always a little skeptical of books that originate from social media, but this one is a delight. Baseball Card Vandals is a gleefully silly Instagram account, where the Abbott brothers draw on old baseball cards to make dumb jokes. The reproductions in the book are surprisingly high quality. It's even better than if your Dad used his color printer to print the Internet for you! The true story and bizarrely brilliant art of the creative duo Mashable called "the Rembrandt and Picasso of vandalized baseball cards." Every day since 2012, brothers Beau and Bryan Abbott have drawn crude jokes on their old trading cards from the '80s and '90s and posted them on Tumblr, Twitter, and Instagram as Baseball Card Vandals. Now the fruits of this completely unnecessary labor have been collected in this stunningly absurd book. Inside you'll find a collection of over 200 "expertly" vandalized cards—including dozens of never-before-seen artworks—that blend the Vandals' signature oddball humor and artistic flair with a charming dose of sports nostalgia. 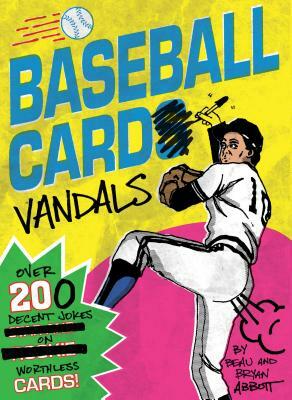 Featuring an introduction on the Baseball Card Vandals history and process as well as a beautiful design inspired by vintage baseball cards, this book will be a hit with sports fans, art lovers, memorabilia collectors, pop culture watchers, Internet geeks, comedy connoisseurs, and permanent marker sniffers everywhere. Beau Abbott is a copywriter and Bryan Abbott is an art director. They both live in Culver City, California. "This is the scariest book I've ever read. Bo Jackson? Not in mint. Oscar Gamble? Good luck getting the Beckett-suggested minimum price for that. And the Ken Griffey Jr. card? THE Ken Griffey Jr. card? Don't read this book if you're faint of heart. But for the few, the brave, the kids who weren't above busting out a ballpoint pen when they noticed they'd somehow managed to get eleven Alan Bannister Topps cards...Beau and Bryan Abbott have you covered." "Two Culver City-based guys calling themselves 'artistically-inclined weirdos' have created a following ... so a book spinoff is kind of natural. They didn't throw away their old common cards as kids, but instead experimented on them through the fumes of Sharpies, Wite-Out and glue sticks with name and word play. It belongs shelved in the humor section of book stores, snickering across the aisle at the stodgy baseball hardbounds."